On World Alzheimer’s Day we look at the impact Shared Reading can have on the quality of life for those living with dementia in the UK. The impact of dementia is one of the biggest growing health concerns worldwide. In the UK alone over 820, 000 people are living with Alzheimer’s and other forms of dementia and that figure is predicted to increase by 62% by 2026 according to Alzheimer’s Research UK. For those living with dementia, Shared Reading can offer a significant improvement in quality of life through cognitive stimulation, social interaction and meaningful engagement each week. In partnership with the NHS and private care providers such as BUPA, The Reader works with people living with dementia in care homes and in the community, running weekly Shared Reading groups where poems are read aloud by a trained facilitator, a Reader Leader. The rhythm and rhyme of poetry can have a calming affect and it’s easier to hold the significance of a particular word or line rather than the thread of a story. Poems are often reread two or three times so group members can get a stronger sense of the words. The wider impact of the Shared Reading group extends further than the reading aloud of poetry, the discussions stimulated by it can also have a huge impact for those living with dementia. Reader Leaders ask group members open questions about the poems, fostering discussion, stimulating thoughts and encouraging individuals to share personal responses and connections to the literature. Care home staff have noted that the group can sometimes be the only occasion when some residents will interact with others. 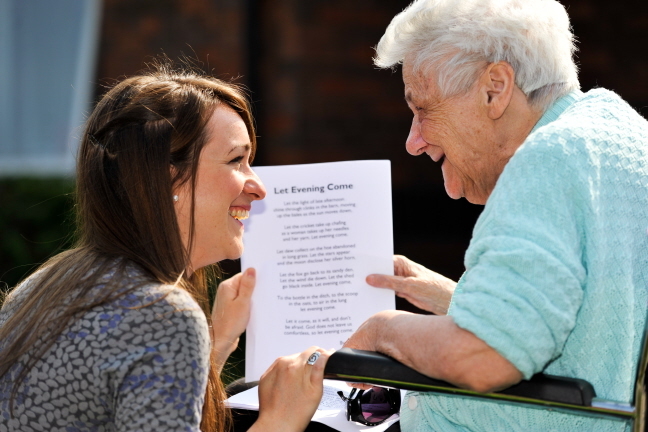 This human connection between group members and with the Reader Leader or care home staff can often provide as much comfort as the poem itself. “It makes you feel important, that you matter because you want to know what’s going on. I mean if you didn’t come, we’d have nothing to think about. It’s surprising what it does to the mind. Your mind starts wondering when you’re unhappy, it wanders too much. Alice’s dementia is advanced and affects her speech. She talks in a ‘made up’ language, and only occasionally says words that others can understand. I had worried that she wasn’t getting much from the poetry we read in the Shared Reading group, but one day Alice held up the poem to me and shook her head – I realised that I’d given her the wrong poem, and she was aware that she was unable to follow along. I gave her a copy of the right poem and she raised her voice, read out the title (fluently) and began to read the poem to the whole group. A lot of her words were incomprehensible, but occasionally she would read a line or a word correctly, and it was clear that although we couldn’t necessarily understand every word, she was following through it systematically. When Alice had begun reading, some members of the group tutted and muttered to themselves but when it became clear that the Activities Coordinator and I were listening, the group gradually gave to attentive silence. At the end of the reading Alice got a round of applause from the group. She has done the same thing a couple of times since – making me realise that although she can’t communicate, she is very aware of where she is in the group, and enjoys being there. All our Reader Stories are anonymised, names are changed and identities protected.